Hair loss is a problem for every other person in the world today. It not only damages your outward appearance, but self-esteem and other psychological issues are associated with it like all other dermatological problems. But most of us do little to prevent it. In fact, we always put ourselves under more and more depression every time we look into the mirror. This added depression worsens the problem. We always look in the wrong places to stop our degrading health conditions. We start asking and listening to friends and community, who are inexperienced in this field. Little do we acknowledge the fact that we can prevent much of it naturally through our diet and routine. There are many natural ways to prevent hair loss. First of all, you should give up junk or fast food. This food is rich in animal proteins and fats which do not help hair growth. Such food also lack essential vitamins needed for healthy growth of hair. Use fresh fruits and vegetables, rich in vitamins and minerals like zinc and iron. Use supplements for these minerals if your diet still lacks in some of them. If you think that your diet is healthy and you are still losing hair, it is time to look at other natural ways to prevent hair loss. Evaluate your stress level. Stress and anxiety accelerate hair loss. Try to take yourself out of it. Keep yourself happy and exercise moderately. It helps relieve your anxiety and stress. Another cause may be smoking. It has been proven through scientific research that along with other damages, smoking is also a cause of hair loss. Try to quit smoking if you do. 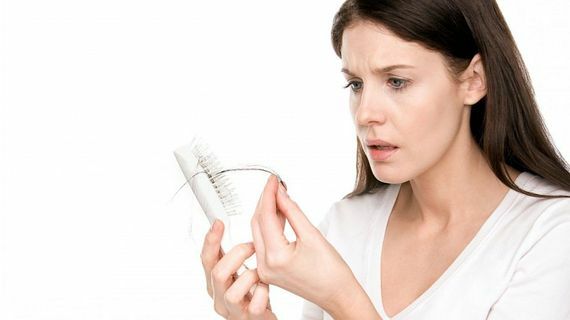 Hormonal shifts and age can also give rise to hair loss. This may be triggered naturally sometimes but many a times, it is caused by some medication that you are using like birth control pills, menopausal medications or just some chemical medication that you are using on your scalp. Consult your physician and stop the use of such medicines for some time to notice the trend. If your hair loss reduces or stops, get rid of those medicines and use some other alternatives. Sometimes simplest things and practices may cause hair loss. Using brush in dry tangled hair may weaken their roots and ultimately cause them to fall. Dry your hair a bit and then use comb to get rid of tangles. Always use a bottom up approach when combing, meaning you always go from tips to roots of hair. Avoid intensive heat of hair dryers and the like. Do not use perms or rollers too often. All these damage hair and weaken them to the point of breaking. If you are a field worker, excess of dust and sunlight may also damage your hair. It is advisable to wear a hat to prevent your hair from dust and sun. This also helps prevent hair loss. Alcoholics lose more hair. Avoid alcoholic drinks and drink a minimum of four to eight glasses of water daily. 25% of your hair contains water content, so drinking water helps them grow. Simple things like changing shampoo or other hair products might also help in reducing hair fall. Use diet that is specifically rich in vitamin A and E. Indians, Egyptians and Chinese had the loveliest hair historically. One of their secrets to beautiful hair has been use of oil to protect hair. Dryness and dandruff is a big cause of hair loss. Mustard, Olive, Ginger, Onion, Coconut and countless other oils can be used in hair to provide them with essential minerals and make them silky, straight and healthy. Any of the above may apply to you and help you reduce hair fall naturally. However, you should react instantly to hair loss and if it still continues, you should always consult a dermatologist.